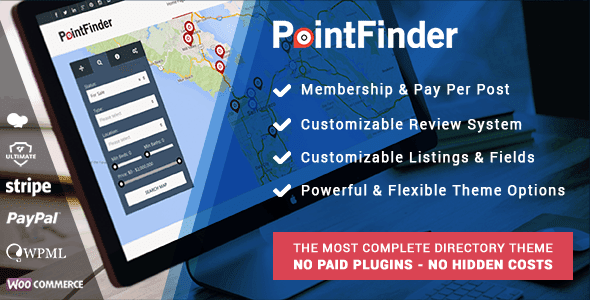 Point Finder is Clean multipurpose Retina Ready WordPress Directory Theme design, that is fully responsive, retina-ready and optimized for mobile devices. You can use in any niche business like an automotive, business, car dealer, classified, directory, google map, job, listing, local directory, maps, real estate, restaurant, reviews, Streetview. This theme will allow you to create a listing & directory website or blog in just a few minutes. You get unique page transitions and distinctive typography and customizable quote calculator, with free updates and free support by our highly acclaimed team.